Munkfors leads the development of tools for sawing and cutting in the food and woodworking industries. The quality products enable our customers to improve productivity and sharpen their competitive edge. For more than 50 years Munkfors has been known for superior quality, reliability and innovation, features that are incorporated into the entire product line and services. 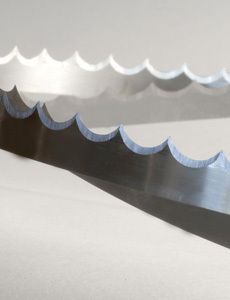 Munkfors band saw blades, band knives and slicer blades are employed in environments where high and continuous output is required and hygiene is a must. Although the products make up a small part of overall production costs, they are critical for your operating reliability and output. Through special manufacturing technique, these high performance blades outperform most other brands. The benefits include less downtime, less inspecting for faults and consequently lower costs because longer runs are guaranteed. An excellent choice of high-performance band saw blades, band knives and slicer blades for use in a wide range of food processing. The design, functionality and sharpness of Munkfors blades, knives and slicers give the food industry many benefits. They help to achieve cost-effective processing, a product appearance that attracts consumers, hygienic practices that minimize microbial contamination, and safe working routines. A good surface finish on meat results in better bloom and colour retention, and increases product shelf life. Furthermore, the right cutting geometry of the blades minimizes waste and helps to keep product surfaces clean.